The Sidewinder B-TX LE 50th brings mountain riding eastward, displaying a vibrant retro red and white color and graphics scheme with a performance matching FOX Zero QS3 shock package and adjustable ski stance. TAPERED TUNNEL DESIGN: The light weight, two-piece, tapered tunnel of the Sidewinder X-TX SE 137 gives you strength for the long haul and a tapered "fit" for enhanced leg comfort and overall ride positioning. The reinforced running boards are punched with aggressive boot hold serrations and offers excellent snow evacuation to keep your feet planted where you want them. HEATED MOUNTAIN SEAT: Lightweight, with a tall and narrow profile, the Sidewinder B-TX LE 153 50th mountain seat is both shorter and more tapered towards the front than our standard trail seat. This allows for easier rider transitions from side-to-side, and improved stand-up ergonomics. And you'll appreciate the toasty warm heating element on those cold mornings heading up the mountain. DIGITAL GAUGE: Full-featured and easy to read, the digital gauge displays critical information in a glance including speed, fuel level, trip mileage, tach and more. We even included a clock so you can watch the time fly. STANDARD ELECTRIC START: Yamaha's electric starter system allows you to fire up your Sidewinder with the turn of a key. There is no pulling on a nylon cord to get this high-tech engine growling! And you don't pay more - Electric start is a standard feature on all of Yamaha's 4-stroke machines. CENTRALIZED MASS DESIGN: The SRV chassis layout was engineered with the goal of centralizing mass. Approximately 60 percent of the sled's weight is tightly centered within the main triangulation. 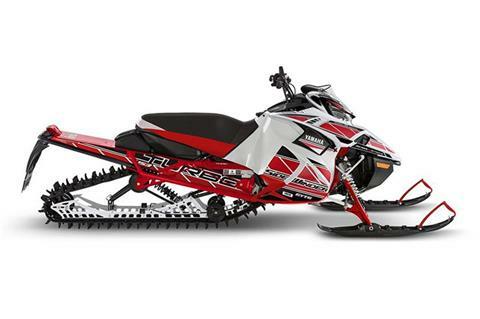 The result is a quick-handling, well balanced sled, that's fun to throw around in a wide variety of conditions. SRV FRONT SUSPENSION: The SRV front suspension geometry is aimed at managing spindle camber, resulting in minimized bump-steer and maximized cornering bite giving rider confidence in varying trail conditions. The A-arms are mounted at a 30-degree angle from the sled's centerline to efficiently dissipate impact force throughout the entire chassis. Likewise, the front shocks mount directly to the leading spar so that trail forces are routed to the strongest part of the chassis. Wide a-arm spacing minimizes flex and stress in the front suspension system, which means consistent and confident corner handling. FOX® QS3 SHOCK PACKAGE: The Sidewinder B-TX LE 153 50th receives a full complement of top shelf FOX® QS3 shock absorbers. The front suspension gets twin, coil-over QS3R's with remote reservoirs and 3-way QS3 damping adjusters. The front skid frame arm gets a damping adjustable QS3 and the rear arms QS3R is the perfect mate to the front end with remote reservoir and 3-way damping adjuster. 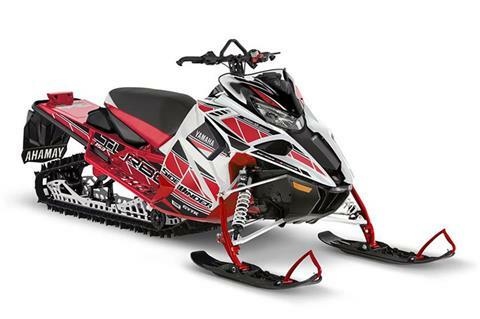 LIGHTWEIGHT SRV MOUNTAIN CHASSIS: The SRV M chassis combines a load-bearing triangulated structure with lightweight aluminum construction to create a neutrally balanced sled that's centered on the rider. The pyramidal upper frame creates chassis strength without excessive weight. ELECTRONIC AIR BYPASS VALVE (APV): Unlike conventional turbo 'blow-off' valves, the Yamaha ABV redirects air pressure back into the intake side of the compressor to prevent surge and help maintain impeller speed, always at the ready for the next acceleration with seamless power delivery. LIQUID COOLED TURBO BODY: Engine coolant is circulated through the turbocharger to control both underhood temperature and help cool the intake charge. Upon engine shut down, the convection energy produced by super-heated coolant at the turbo head keeps it circulating without the coolant pump in operation. This eliminates the need for an engine cool down cycle while maintaining high durability in the turbo components. 998 GENESIS TURBO ENGINE: The turbo boosted, one liter triple is unmatched when it comes to delivering incredible power with the refinement and quality you have come to expect from a Yamaha. Designed around a premium turbo unit, every engine component from intake to exhaust, is dedicated to producing uncompromised performance. 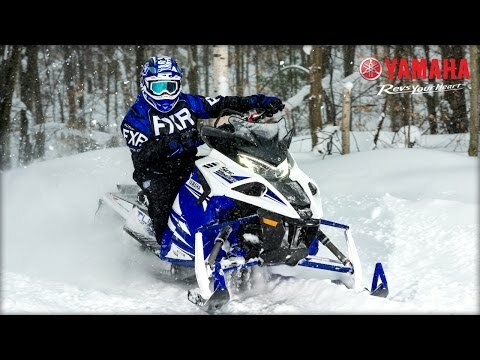 In only its second year in production the Yamaha turbo has earned the respect and reputation befitting the industry’s highest achiever. Truly this is the potent venom of a Sidewinder X-TX SE 141 bite. YSRC HIGH PERFORMANCE CLUTCH SYSTEM: The YSRC primary and roller secondary clutches were specifically designed for durable, cool operation. They harness and transfer the massive torque produced by the Genesis Turbo, efficiently to the track while minimizing drive belt wear. The primary shifts out aggressively to use all the power on tap while the roller secondary is quick to back-shift and provides additional ratio through its oversize sheaves to keep accelerating long after the others have signed off. ADJUSTABLE 40 INCH SKI STANCE: The 40 inch ski stance hits the sweet spot between on trail stability with cornering prowess and off-trail maneuverability for deep snow carving with quick transitions from side to side. The rubber pillow blocks on the skis can be cross fitted providing additional ski width adjustment. 2.25 INCH POWERCLAW TRACK: The 2.25 inch lugged PowerClaw track was born in the Rockies and offers up the best traction for off trail play wherever that takes you. The long 153 inch length offers plenty of float and lift to keep you going while its not so long that you have to struggle to maneuver in tight, challenging terrain. SPECIAL 50TH ANNIVERSARY STYLING: The brilliant retro red and white paint scheme is accented by the slick black 'eye-liner' wind deflector and hi-impact graphics. This limited model is sure to become a collector’s item for long time Yamaha fans.